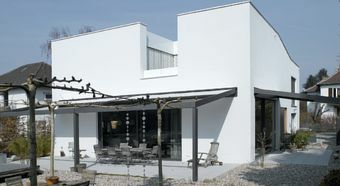 This single-family house in Darmstadt makes an impression with its striking architecture and smart building technology. Outside, broken cubes create a modern look. 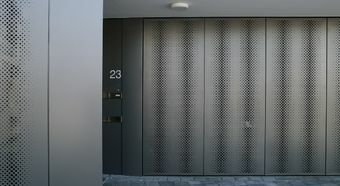 Inside, highly modern facilities provide a trend-setting residential ambience. 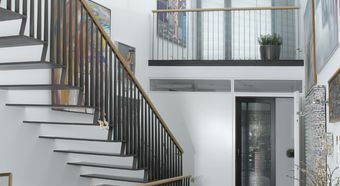 An impressive entry area stretches up through the whole height of the building. On the ground floor, next to the living and kitchen areas, is a self-contained annex used as an office and a garage adjoining the house. 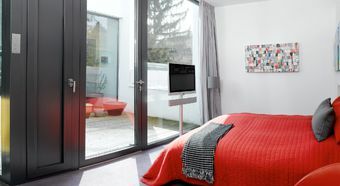 On the upper floor, a bedroom, bathroom and sauna offer the residents a spacious place for retreat and relaxation. The atrium, the floor to ceiling windows on the ground floor, and the lofty ceiling heights create spaces flooded with light. 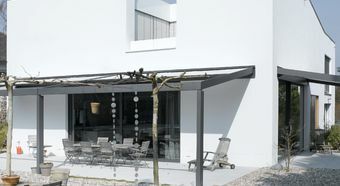 Awnings provide the shade necessary to control sunlight on warm days as needed. The JUNG Facility Pilot Server is the house’s central control unit. 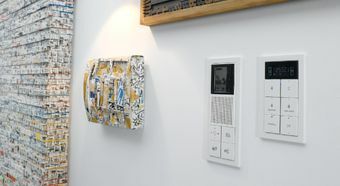 Lights can be switched on and off or dimmed, as well as window shades and other systems regulated, from a 15-inch touchscreen installed in the kitchen. These functions can also be managed from an iPad from the comfort of the couch. 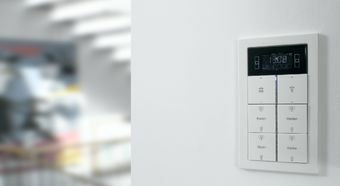 Heating/cooling: The integrated room temperature controller of the JUNG room controller with display regulates the temperature. 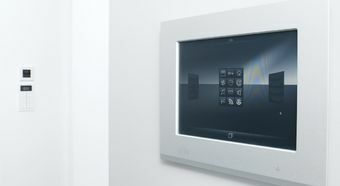 Interior/garden lighting: is regulated by the room controller via six buttons. Shade: Depending on the exterior brightness and temperature, the external window shades are raised or lowered automatically, but can also be operated manually at any time. 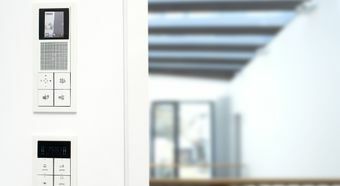 JUNG’s door communications management ensures the highest security and comfort, enabling residents to see anyone wanting to come in, from any floor in the house via video. Sensor button symbols make the smart technology even easier to use. Users can design the labels of the buttons themselves with the JUNG Graphic Tool. 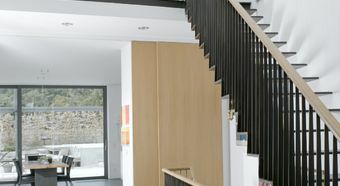 A geothermal heat pump, ventilation system and the use of rainwater for toilets and for watering the garden ensure energy-conscious, sustainable and comfortable living.